One of the things that surprised us most about Palm Springs and the Coachella Valley was the size of the surrounding San Jacinto Mountains that rest on the eastern side of the valley. The rugged mountain range reaches heights over 10,000 feet, which is almost 4-times the height of the world’s tallest building (the Burj Khalifa in Dubai – 2,723 feet). 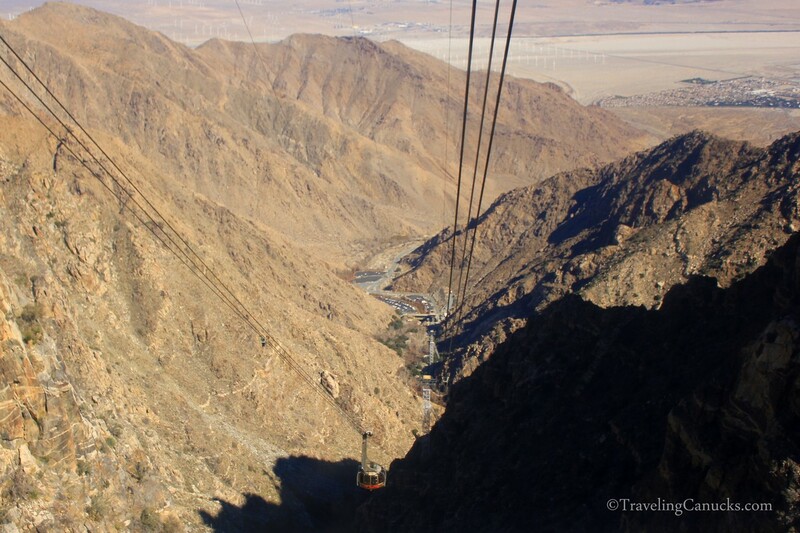 A popular way to experience the rocky desert mountains is to take a ride on the Palm Springs Aerial Tramway, proudly labeled as the largest rotating aerial tramway in the world. Feeling like we should peel ourselves from the poolside loungers for an afternoon adventure, we decided to take Baby B up the mountain tram to check out the desert views. Fortunately for us, the aerial tramway is located close to the apartment complex that we were staying at in Palm Springs. 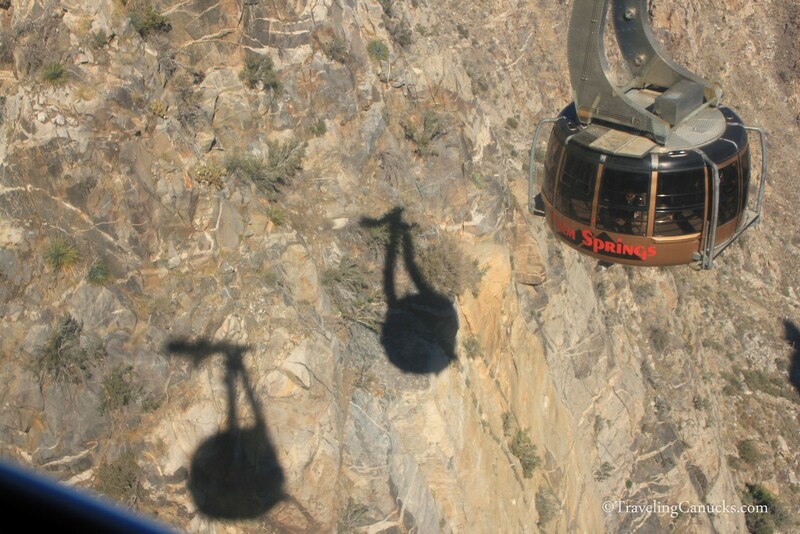 Having never been on a “rotating aerial tramway”, we were curious to see what it was all about. Basically, the tram car has a rotating floor that makes two complete revolutions during each trip, allowing passengers to soak up the views from every direction. 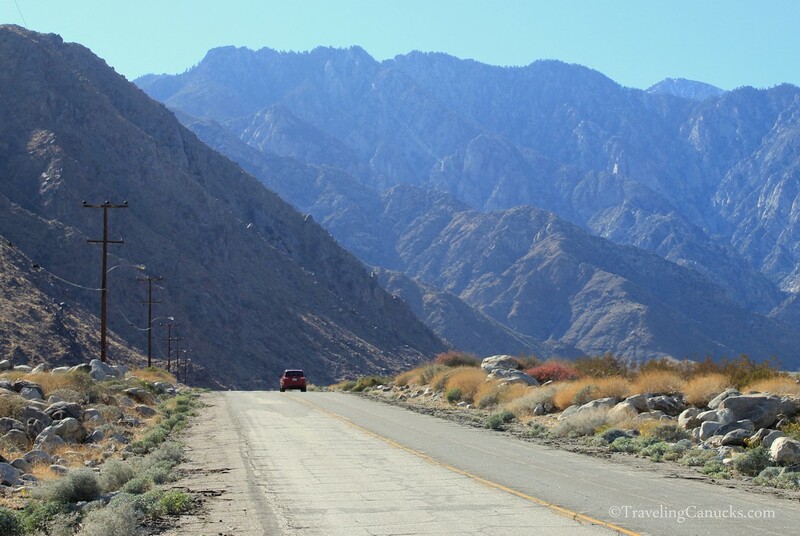 It’s an interesting ride that rewards visitors with outstanding views of the rocky Chino Canyon and the desert plains of the Coachella Valley (pictured above). Baby B hiding from the sun on the ride up. Mountain station lookout point – notice the snow under the platform. The mountain station is also the entry point to Mt. 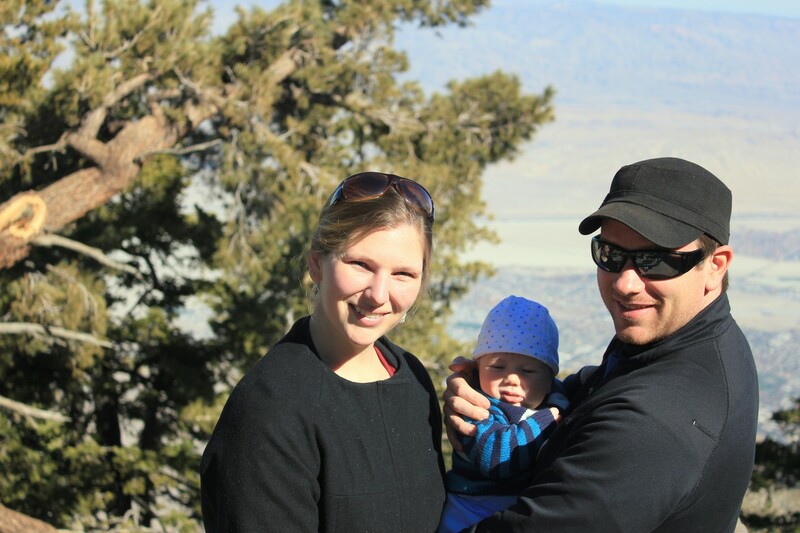 San Jacinto State Park, offering hikers 54 miles of hiking trails and over 14,000 acres of wilderness to explore. We had good intentions of going on a hike in the park but only got a couple hundred meters before Baby B decided he wasn’t having any of it and started screaming. 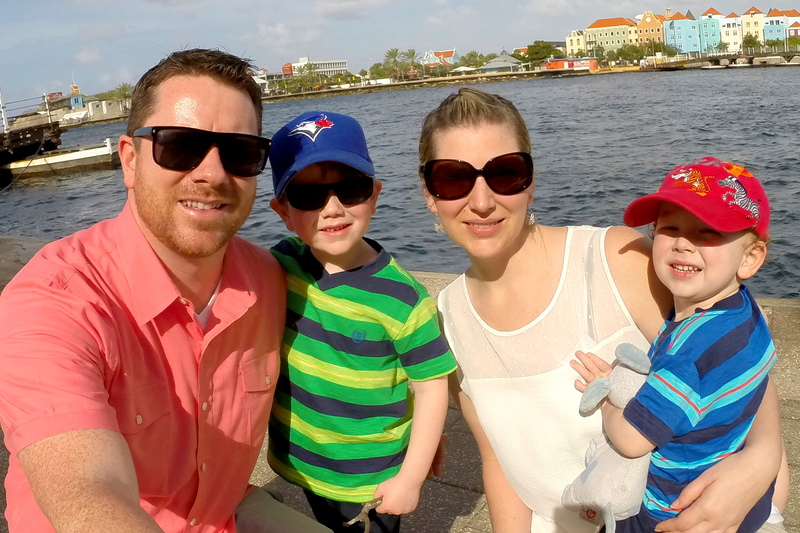 We’re quickly learning that outdoor adventures are much different when you have a baby! Needless to say, we turned around and decided to have lunch in the restaurant instead. Travel Tip – Bring a coat and dress warm, it’s cold and windy when you get to the top. It’s hard to imagine wearing jeans and sweaters when you’re sitting by the pool in the hot desert sun, but you will suffer if you don’t prepare for cold weather. The park boasts snowshoeing and cross country skiing in the winter, but there was very little snow at the time of our visit in early February. 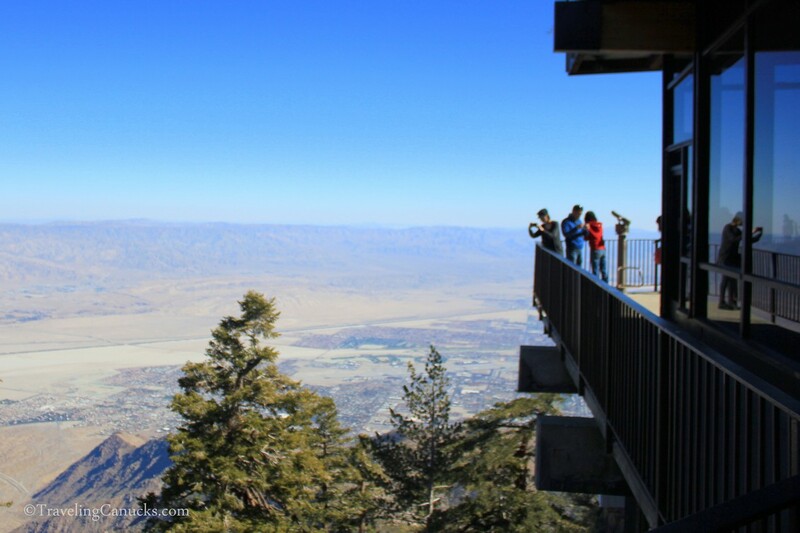 Have you taken a ride on the Palm Springs Aerial Tramway? Yes – the difference in temperature is quite drastic! A friend just rode this last week. She said it was awesome! I hate that I missed it when I visited Palm Springs. 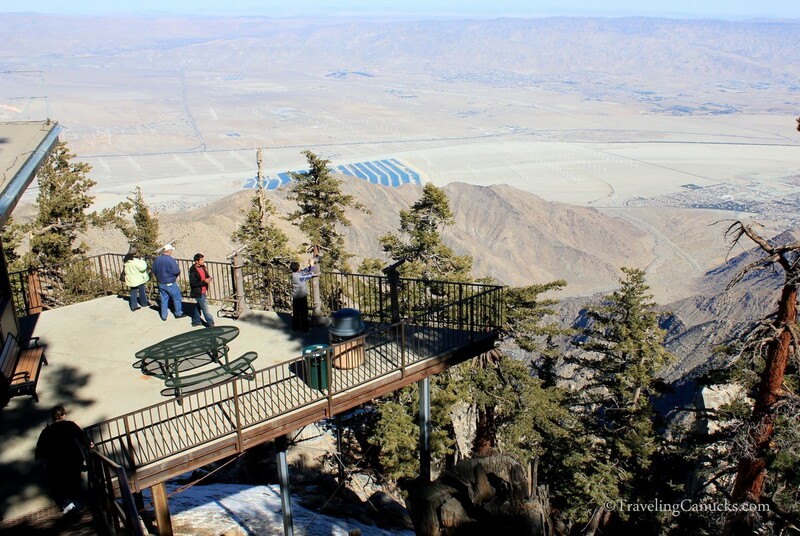 It’s certainly a great way to see the Coachella Valley! Thanks for this great recommendation! I was in Palm Springs a number of times, but never made it up the mountain. Your images are proof of what I missed. Next time I get there this will be the first I’ll be doing. And I would never have taken warm clothes up on the mountain – being in the desert. The mountain shots are absolutely stunning and looks like quite a spot for spectacular views. I’ll be sure to keep this on the radar when I visit Palm Springs & good tip on the warm gear…when I was in Vail last year it was a bit nippy in the mountains. Beautiful pic of mom and Baby B! It certainly gives you a different perspective. We were amazed at how big the valley is! I’m always impressed by how high these cable cars get you. Its a great vantage point, especially in the desert when the ground-level landscape isn’t always too impressive. The last car I went up on was the one groing up Grouse Mountain. The car swayed a lot and then had a harsh stop in the middle of the ride, and we were up there for a while. I don’t see myself repeating that experience any time soon. I’ll just live vicariously through others, like you two. 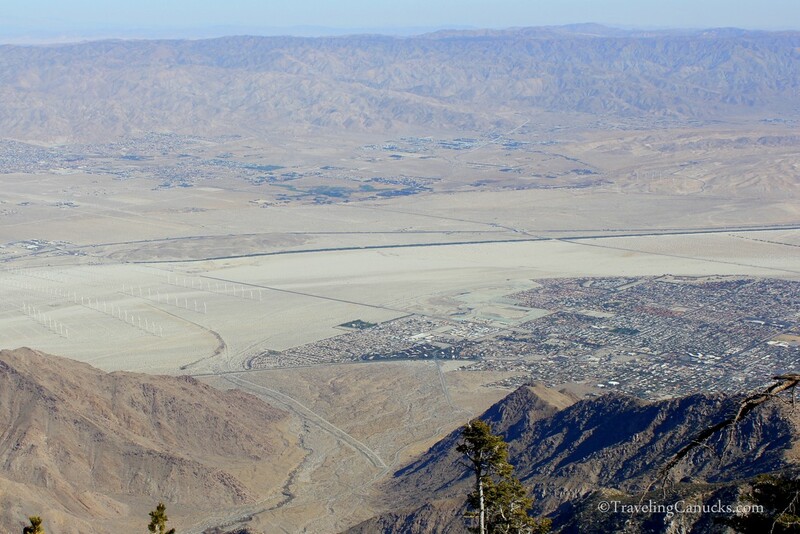 The Coachella Valley and Palm Springs I think I’m gonna fall in love with the picture. Hope I can visit the place. I like the picture, especially Chino Canyon love to cross the road. Hoping to visit the whole place you’ve been through. I really love the views that you have captured during your trip – makes me wish I lived much closer to the mountains. It was a lot of fun! Hopefully you can too. I wanna try it since I’m sure it would be a pretty exciting experience plus you’ll get to see how beautiful the place is. But isn’t it scary to take a ride on the Tramway? Thanks for sharing this one. Wow the feeling should have been awesome… when you are inside this…. Looking forward to have a visit at this place once…. wow .. This are really awesome photography…..